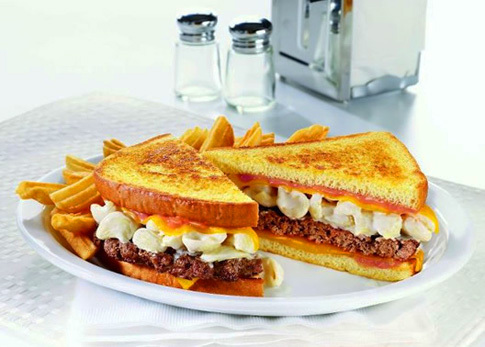 This blog will attempt to link the new high-power 1,690 calorie sandwich from Denny’s to Maya Angelou’s displeasure at the quote on the new, gigantic statue of Martin Luther King Jr. in Washington D.C.
First, the sandwich named “Mac ‘n Cheese Big Daddy Patty Melt” sounds complicated. It’s bold, willing to take on and conquer people who care about their health because they want to live longer, yet it is also willing to dangle greasy cheesy goodness in front of restaurant aficionados who might already be dangerously obese. What is this cheesy Big Daddy? A yummy, delectable burger slathered with creamy Mac ‘n Cheese, then melted cheddar cheese then topped with Frisco sauce – a mixture of 1000 Island dressing and Italian dressing – on grilled potato bread. Wash it down with a strawberry milkshake and you can cry justifiably when you hear the oldie “Nothing Compares to U” by Sinead O’Conner. This ode to excess brings me to MLK at the Mall. I first saw a picture of it a few days ago and was struck by its enormity. Rising from the ground, it is a 30-foot tall monument to the civil rights leader. It’s the first statue on the National Mall that is not a president or soldier, and I say great. Martin Luther King should be represented at the National Mall because he made the first black president that we have now, possible. But a few controversies surround the statue: award-winning writer Maya Angelou is vocally opposed to a paraphrased quote on the MLK granite statue. Angelo says the quote makes King sound like a “pompous twit.” Since she is lauded for her use of the English language, I found her description curious. It’s like I heard a chord out of place in a song. How does that equate to “pompous twit?” It doesn’t. The chief architect of the statue, Ed Jackson Jr. said the quote was shortened and moved because of space concerns. one meeting. It seems hypocritical and a little self-righteous to criticize the choice now. The granite slab from which King is carved is called The Stone of Hope. I call it the Stone of Regret. That’s how the Big Daddy sandwich and King’s statue are tied together. The first you regret eating; the second you regret the indebtedness, the allegiances and the dependency on a country that is cold-heartedly swallowing the United States one dollar at a time. 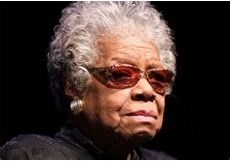 And Maya Angelou probably regrets not attending those committee meetings. I’m sure if McDonalds served a cow patty on a bun someone would buy it! Wonder when a statue of Mohammed will be erected in D.C….its only P.C. to have one somewhere…gotta please everyone who comes to this country…Buddah in San Francisco?